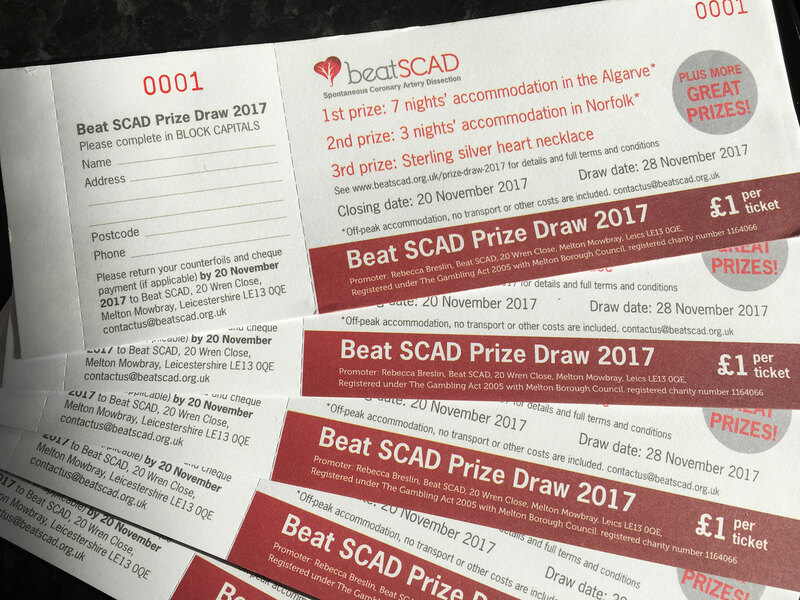 Beat SCAD has launched a Prize Draw to raise money for the UK SCAD research project. The SCAD research project has, until recently, been partly funded by the British Heart Foundation, however that funding has now come to an end. The National Institute for Health Research (NIHR) is continuing to provide some funding, which Beat SCAD and SCAD survivors welcome. However, without further funding the future of the project is at risk. Around 120 patients have so far been on Research Days, but there are more than 500 people registered for the research, and without further funding these SCAD patients cannot all be seen by the SCAD specialists. We want to ensure that EVERYONE who is registered sees the research team, so please help us raise the funds by selling Prize Draw Tickets. We have some amazing prizes on offer, including 7 nights’ holiday accommodation in the Algarve, 3 nights in a beautiful cottage in Burnham Market in Norfolk, a stunning sterling silver heart pendant, a beautiful hand-made quilt – and more! Click here to see the prizes. For tickets please click here to email us and give us your name and address and how many books of tickets you would like (each book contains five tickets). The Draw will take place on 28 November 2017. Closing date is 20 November 2017. Full terms and conditions can be found at www.beatscad.org.uk/prize-draw-2017. Don’t miss out on a chance to win one of our fantastic prizes!